GARY, Ind. (WLS) -- A 23-year-old man from Gary had to be extricated from a car Wednesday morning after the vehicle ended up underneath a semi on westbound I-80/94 in northwest Indiana. A 2001 Chevrolet Cavalier traveling west in the left lane of I-80/94 suddenly crossed several lanes to try to get to the exit lane for Burr Street around 6:25 a.m., Indiana State Police said. The driver lost control of the car, which hit a construction barrel and went into the right lane, hitting the back end of a semi trailer at a 45 degree angle, police said. The vehicle went under the trailer and was dragged about 290 feet before coming to a stop. The driver had to be extricated from the half-crushed vehicle. He was transported in serious condition to North Lake Methodist Hospital and then flown to Loyola University Medical Center in Maywood, Ill. The 2013 International semi, which was pulling a box trailer, is owned by Cardinal Lights Management, which is based in St. Charles, Ill. 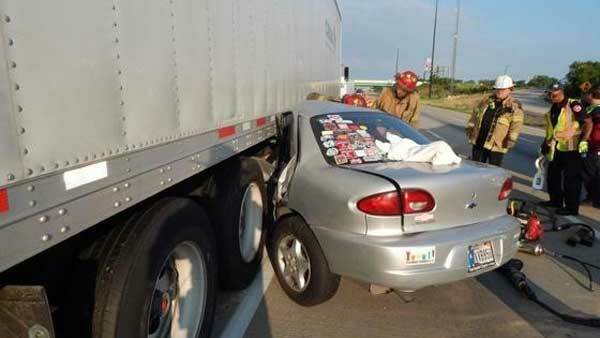 The 25-year-old male driver from Dickson, Tenn., and his passenger were not hurt. Since the semi did not lose its load, the cleanup and investigation only closed the right lane of westbound I-890/94 until around 7:45 a.m.